The Original 70mm Engagements Of "The Empire Strikes Back"
What follows is a list of the known 70mm engagements of the movie "The Empire Strikes Back" (aka "Star Wars: Episode V - The Empire Strikes Back"). As one can glean from the list, 70mm engagements were aplenty on this title, with many "out-of-the-way" places often playing the movie in 70mm. What is noteworthy about the release of "The Empire Strikes Back" with regard to the 70mm presentation format is that the film was (at the time) distributed with a record number of large-format prints for a saturation, non-roadshow-type release, eclipsing the record set the previous year by "Alien". "The Empire Strikes Back" opened with a modest number of initial wave engagements, reportedly 127, most of which are identified in the list below (check this Web site periodically for updates). It appears that with the exception of a few drive-in bookings, all of the first-wave engagements were in the deluxe 70mm format. Additional 70mm engagements were added during the "expansion wave" releases throughout the summer of 1980. Also of interest to some may be that the 70mm prints of "The Empire Strikes Back" differed from the 35mm version in that some editing differences, additional shots, alternate takes, and extra dialogue can be detected through a comparison of the two versions. It is understood that when the movie was considered "finished," the elements were turned over to the lab and sound facilities so the desired 70mm print order could be prepared. 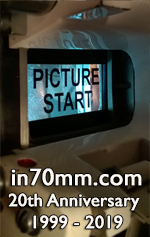 The filmmakers, however, elected to "un-finish" the movie and make a few, albeit subtle, changes that, considering the expense and time involved in re-striking and and/or re-sounding 70mm prints, were reflected only in the film's 35mm prints. There is a bit of irony in all of this trivia: the majority of the public and media who saw the movie in its first month of release saw the "less complete" version. Spanish title: "El Imperio Contraataca"